Nothing else is 100% confirmed about The Taken King, but you can find all details about the trademark here. We do have a lot of theories about what this expansion could be about though! Outdated information, but the “Comet” activity amounts may be accurate. As you can see from the image above, “Hive Ship” might be a new location in The Taken King. It’s unclear if this is still valid, but it definitely seems to be a Hive-orientated expansion. Supposedly there will be 12 new story missions, 4 more Strikes, 1 additional Public Event, Patrol, & Raid, and 6 more Crucible arenas. 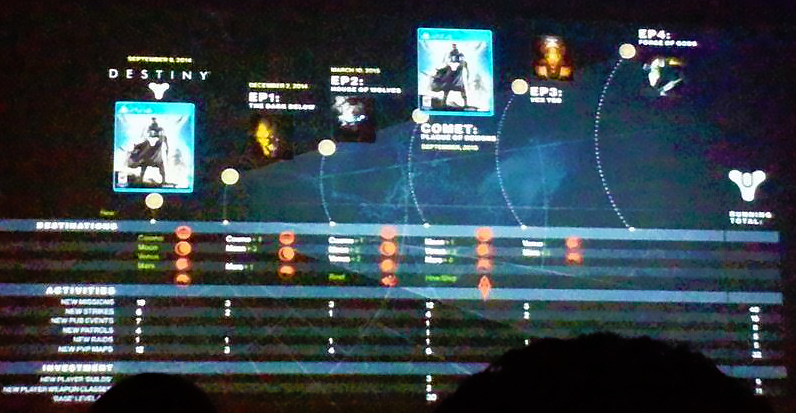 You can see that there are “new player weapon classes” set for “Comet” in this leaked image, but of course this is an outdated leak, and nothing is confirmed yet. This major downloadable content expansion is planned for Fall 2015, but nothing concrete other than that.